Still available. 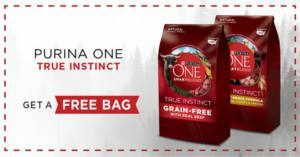 Sign up to get a FREE (Up to $9.99) bag of Purina ONE Dry Dog or Cat Food. While supplies last, coupon expires 4/1/20. NOTE: Click ‘Get Offer’ button and fill out the form.